Giantex Set of 4 Folding Chairs Fabric Upholstered Padded Seat Metal Frame Home Office Furniture, Black by Giantex at RVTE. MPN: HW58552. Hurry! Limited time offer. Offer valid only while supplies last. 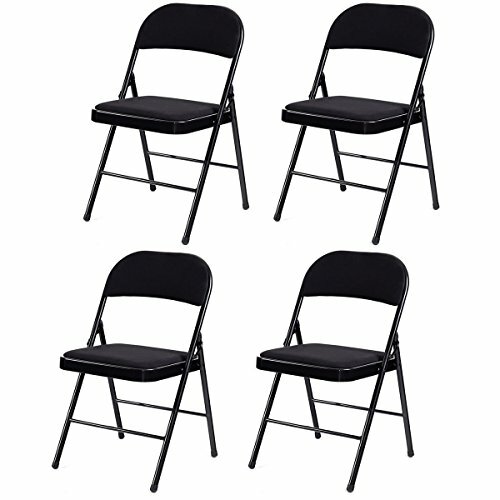 Description This is our brand new 4-piece folding chairs set, which is lightweight and suitable for many occasions such as parties and events. This is our brand new 4-piece folding chairs set, which is lightweight and suitable for many occasions such as parties and events. Featuring high quality powder-coated steel frame, these chairs will assure you comfort and reliability. The fabric seat and backrest are filled with high density sponge, making it more comfortable during a long time meeting. Its foldable construction makes it easy to store and carry. They're almost suitable for anywhere, home, garden, office etc. 4 in 1 set at great price. Don't hesitate to buy it now! Height from seat to ground: approx 18"
【Sturdy and Durable Steel Frame】: Equipped with high-quality premium powder-coated steel frame, these chairs will assure your safety and stability. Exquisite powder coat enables the chair to maintain rust-resistant and long-period use. 【Foldable Space-Saving Design】: All four chairs can be folded into a narrow size and be kept aside after use, which greatly leave much more room space. The folding form also brings you much convenience to take or transport it for outdoor activities. 【Ergonomic & Chic Design: 】: Conforming to ergonomic standard and human body feature, this chair backrest will make you feel cozy and relaxed. Stylish look and classic black color perfectly makes it suitable for any occasion. 【Soft Padded Seat & Protective Feet Cover】: Rounded edge effectively avoids scratches and protects your body and clothes. Chair seat is padded with soft sponge and covered with fabric, making you feel so comfortable. Plastic feet covers protect your floor and one hinge on each side is designed for stability. 【Multipurpose Folding Chairs】: This set of four folding chairs is perfectly suitable for indoor and outdoor use and provides a good solution for your business or entertainment event.